I Will Week officially launches today (30 June to 6 July). 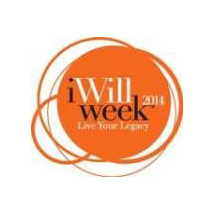 The theme for the week is Live Your Legacy and encourages all Victorians to not only think about what they want to be remembered for and what they will be leaving behind, but to commit to actioning their personal legacy over the week and sharing it with their family, friends and loved ones. A survey by State Trustees into the meaning of legacy has revealed some interesting results. While creating a legacy in life is deemed important to 54% of Victorians, more than 60% haven’t thought about what their legacy will be when they die. In addition, less than 10% of people saw philanthropy as a priority, with most people wanting to be remembered for the things they DID in their life, rather than the things they HAVE. Sentimental legacies resonated well with many of us, with journals, personal memoirs and collections of photographs among the most common legacies people are already curating as part of their living legacy.